Yesterday, Katie Caggiano came for lunch. In fact, she brought the lunch from our old take-out stand by, The No Name Deli. The food was delicious, of course, but the conversation was wonderful. Katie used to work here at Mouse House, Inc. I hired her during the summer just after she gradutated from Dreher High School. She worked part-time, transferred to the College of Charleston, worked in the summer, quit, transferred back to Columbia, and started working full time. Over the years, we watched Katie grow up and become invaluable to our business. More importantly, Katie became a friend. She was the last person employeed by Mouse House (other than Steve and I). I don't think I could have down-sized my business as successfully without her help. She stayed until the Medical College in Charleston accepted her into their physician's assistant program. She just graduated and is about to take her medical boards. Katie really hadn't visited since the house fire so we had fun showing her the new renovations (which are now two years old!) We also showed her the video of Mathias and Sasha's competition performances from Varna. We talked about her new girlfriend, the PA program, her upcoming medical boards, her search for a job, my artwork, and also determined that we'd go to dinner at Hunter-Gatherer next Tuesday night. It was wonderful to see Katie, to catch up, to relax for an entire afternoon with memories and news. We provided a character reference letter which was so easy to write. Katie is wonderful. Whatever business or organization is lucky enough to have Katie accept a position will be forever pleased. 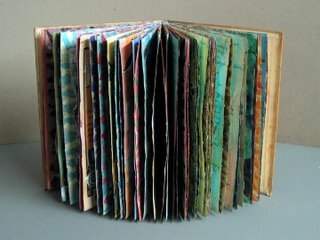 During the past few weeks, I've started another altered book. It uses Malraux's Man's Fate. I've collaged in 1923 playing cards from a game called "Bird Lotto". The message is a mix of extinction, destiny, fate, chance, and man's fate. I mentioned starting this project. Later, I ran out of faux gold leaf, however. I ordered more. It arrived today. I'm toying with ordering a new transfer product called Sheer Heaven paper. In the meantime, I'm heavily into my new archeology project. 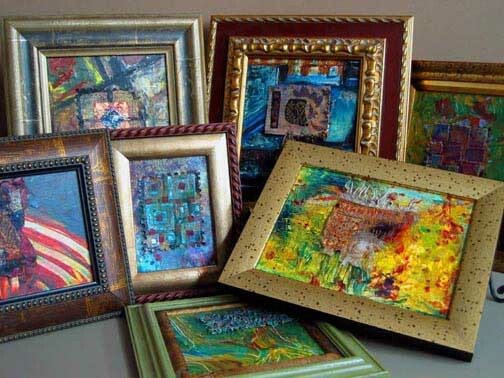 Old pieces have been disected, re-formatted, and stitched into new miniature art quilts. Each simply cries out for beads. Thus, I'm hand stitching and beading almost every time through the Jay Leno show. I'm having a blast. Well, I couldn't manage to post the images within the contents of the last message, so here are some of the images of the collaborative pieces: Jan Kozacheck's paintings with my textile pieces! I shouldn't have worried about my meeting with Janet Kozachek. It went wonderfully, of course. It still doesn't surprise me that I was a little nervous and a lot in awe. Janet is undoubtedly brilliant. She reads, writes, and speaks fluent Chinese and can compare the writing styles from different historic periods and areas. 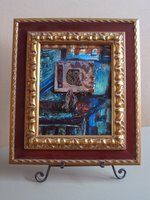 She paints, sculpts, and makes mosaics. She started the International Mosaic Society and teaches Chinese watercolor through the South Carolina Arts commission's Art-in-Education program. Her thoughts are deep; her intentions are serious; her work is infused with passion and vast historical knowledge. We had a blast! I'm not sure what she thought of my work or ideas, but evidently I think she caught on to my concept. I don't think I really expressed my ideas very well. In fact, I really haven't put into words just how I'd like to see this joint venture, though I'm going to try here! I'd like to tap into the natural inclination that people have when visiting sites of great antiquity. We've all wanted to "take a chip off the Coliseum in Rome" or "pocket a little rock from Stonehenge" or find an arrowhead or a shard of pottery. We've all wondered what it would be like to find an Egyptian tomb or rummage through the storage closets of the world's great museums. Popular movies feed this mystery, like Indiana Jones and the Da Vinci Code. Touching ancient artifacts and finding a souvenir are very much part of the myth of archeology. Hence, I'd love to use my three suitcases. I've planned to fill them with remnants from imaginary past cultures and allow people at the exhibit to handle all the contents, read the altered books, turn over the bits of fabric, even buy a little piece or two. I'd like these "fragments" to be packaged with in envelops or small boxes with "authentification" cards, basically a "label" that would give each piece a name and include my signature. I think this would be FUN and potentially profitable. The "fragments" would be creative uses of ordinary materials excavated from the studio. The sales approach would be equally novel. Of course, the larger pieces would hang on the walls. 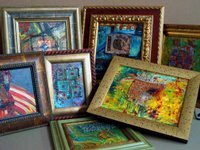 These would be Janet's incredible mosaics and my larger, framed textiles. Slowly Janet could see the unique possibilities. We looked through a suitcase in which she'd stored a collection of incredible Chinese costumes, mainly children's exotic head dresses in the shapes of wild animals. They were colorful, intricate, fanciful. Just touching them was exciting. This was the experience that I hope to bring to the exhibit, the joy of discovery, the thrill of mystery, or exploration through the remnants of time. Then Janet took more interest in the little things in my suitcase. 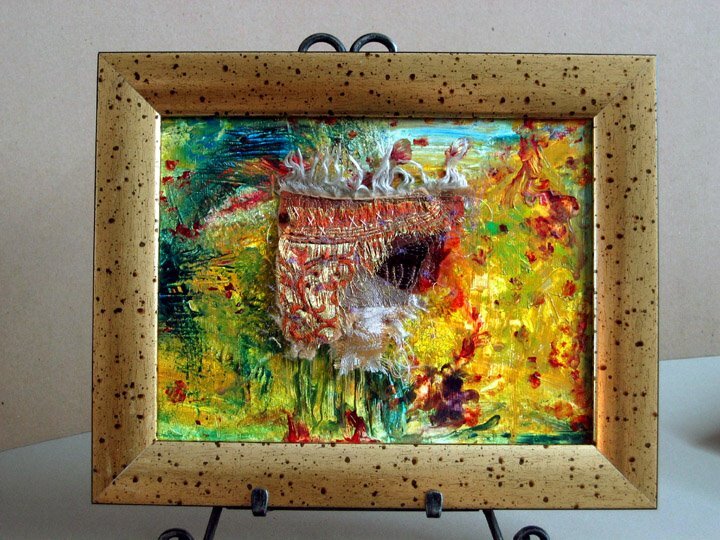 She brought out a large brown paper bag of acrylic painted mat board scraps. We started putting my "fragments" on her paintings. Collaborations were born. Within a few mere minutes, we'd selection several combinations. I reminded Janet that much of this was really her idea. I am still completely drawn to the article describing her show in Aiken over a year ago. ".....The exhibition is a conceptual presentation in two parts. The mosaics represent excavations and the paintings constitute the artist's reflections on the excavations. The two bodies of work are tied together thematically by the artist's longtime interest in archaeology. Her visits to ruins such as Pompeii, Herculaneum, and Ostia Antica informed this body of work. The mosaics are composed of found and unearthed objects as well as high end purchased materials such as smalti and gold tesserae. The juxtaposition of the mundane with the valuable plays human need off human desire the practical need to "waste not, want not" and the indulgent desire to acquire the rare and precious. Archaeology uniformly reveals both. The process took on a life of its own. 'After about six months of working in this manner, the quest away from one thing became a journey toward something else,' says Kozachek. 'As I found frugal and clever ways of assembling the plethora of materials in my studio, my own personal past intersected with my interest in archaeology and imagined civilizations began to emerge in my work an archaeology of the mind.'" As a result, I sewed my pieces straight through Janet's painting and framed up the selections we made. I am more inspired that ever. This should be wonderful! Today I'm headed to Charleston. 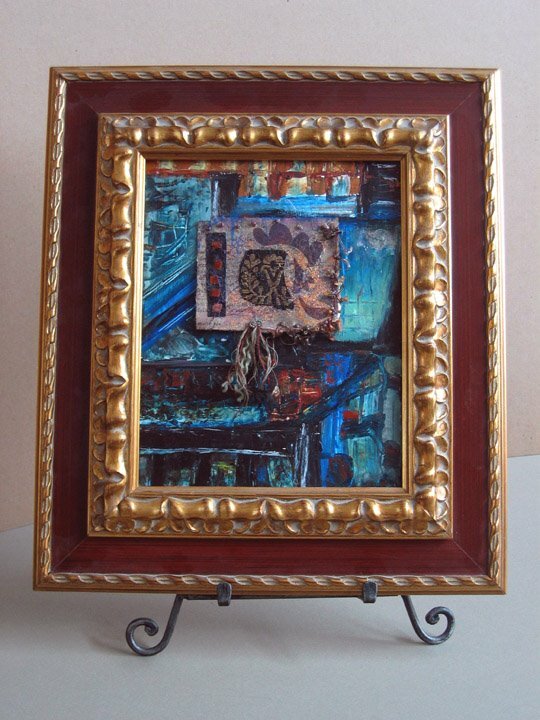 I've got to meet with Leonard Long in order to drop off a few framed pieces and select presentations for two oil paintings by McCullough, a new acquistion and an old one in a tired looking, cheap frame that he's had for well over fifteen years. I'm also going by Terrace Oaks Antique Mall on James Island in order to restock our merchandise. I'm bringing three reproduction Audubon prints (our best sellers, of course, though not antiques), a set of twelve mid 19th century fish from the US Railroad surveys, a set of seven nicely colored early 19th century birds, and a set of three other antique birds. I wish the antiques sold as well as the reproductions, but they don't. Then, I'm going by Janet Kozachek's home/studio in Orangeburg. To be honest, I'm more than a little scared. I'm feeling overwhelmed artistically; inferior in training, experience, intelligence, and both quality and quantity of work. Janet would probably laugh about this. She really isn't a scary person at all. She's only ever been complimentary and nice. Still, I have her up on some lofty pedestal. I can't believe she's willing to share a show with me, with my work. I've got a hour and a half drive in order to organize my thoughts for these three very different tasks. For Leonard (who also scares me to death! ), I've got to try to be quietly creative, business-like, unique, and efficient. I've got to instantly come up with a framing option for a painting I've never seen. He must like it and I must be able to succinctly say why that choice is a good one while letting on that it was his idea to begin with and is simply due to his good taste in art. Fortunately, he has good taste. For Terrace Oaks, I've got to rehang pictures quickly while not interferring with the daily business activities of the mall. I have to do with while chatting with clients, refusing framing work, and being very, very nice to people, some of whom dislike me. For Janet, I'm not sure what I've got to do. Probably, I've got to try and be myself, whoever that is! I'll be on a tight schedule. We've got to try and photograph some of our work together for an exhibition card. I've got to organize myself, thoughts and travel plans! I typed the following message last night on MicroSoft Word right before a tremendous storm blew out the power to our neighborhood. Thus, I'm posting this on a nice, sunny Monday morning instead of on a thunderous Sunday night! 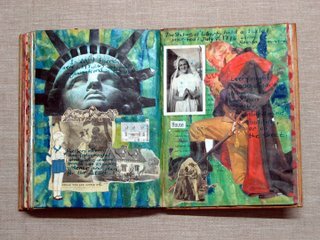 I joined an altered book yahoo group on line last Thursday or Friday. I browsed through all sorts of amazing files and images and decided to join the group. Membership is nearly instantaneous and I spent the better part of that day looking at creative ideas done by people all over the country. 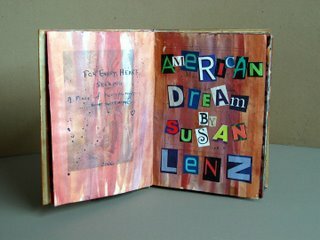 Finally, I printed the upload instructions and posted a few images of my altered book, American Dream. I had no idea what to expect. Would these people like my work? Well, they did. I’ve never received so many compliments in such a short time. I’m truly honored because most of these people have their own websites, blogs, and retail capabilities. They know all the right vocabulary too, like the word “spread” which I thought referred to butter or some sort of banquet fare. No, it is the proper word for two pages of a book that face one another, like when a book lays open on a table—that’s a spread. As many nice things that have been typed to me, I think I got the better end of this deal. 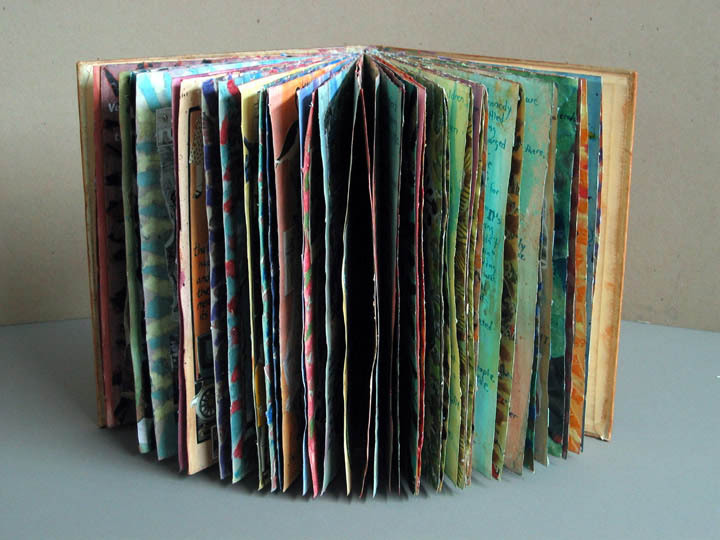 I had little to no idea just how diverse altered book art has become. I knew it was sort of a “fad”, but much of the work is quite serious, very interesting, and totally inspiring. I can honestly say that this project is wonderful. I said before and it still holds, I’ve never had quite this much FUN in the studio. My studio reflects the utter panamonium of true passion and artistic joy. These are photos of two recent works. One is Pointe Mosaic. I created it by deconstructing a pair of $5 sale, very small pointe shoes donated by a local dancewear shop. 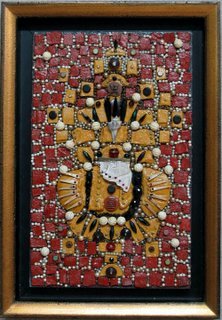 With GAC 400 and paint, I created the small ocher and terracotta "pieces" and then adhered them to a previously painted wooden panel. Beads and found objects completed the piece. It is headed for a charity fundraiser benefitting Columbia Classical Ballet. That event is scheduled for Sunday, September 17 at Leaside here in Columbia. The other piece is Sampler. I stitched it on white linen with red perle cotton. It was designed for the Open Eyes 2006 exhibition. Open Eyes is a group formed to support women's triumphs over staggering odds. The inspiration of this year's show is the work of the local Women's Shelter and the courage of those crossing its threshold. The exhibit is scheduled for October 19-31, 2006 at Gallery 80808, 808 Lady Street in Columbia, SC's downtown Vista area. 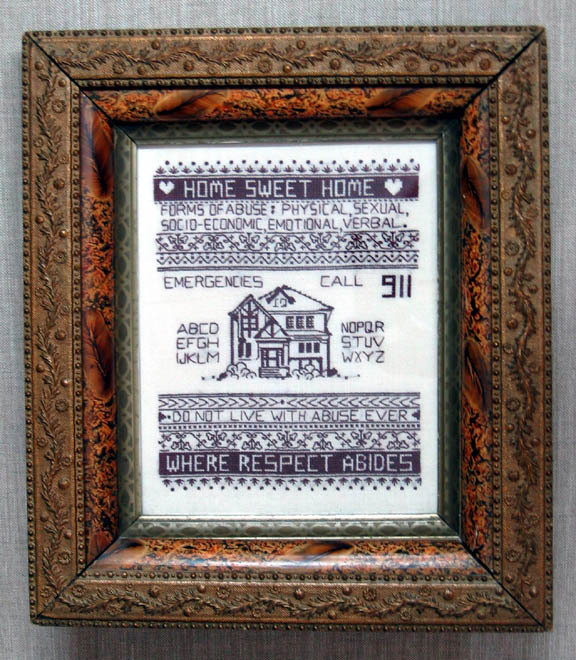 Sampler and American Dream are the pieces I'm submitting to this invitational show. I've just spent a very frustrating hour trying to log onto this site. I never can remember my user name or my password or whether they are case sensitive. Finally, after resetting a password countless times, I figured it out. Maybe these frustrations are the counter result of a glorious weekend in my studio. 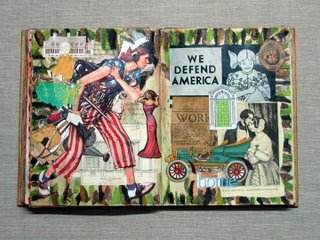 My altered book, American Dream, is now more than completed. It has been photographed and made into a mini-video, complete with a melodramatic instrumental score of Foster's melodies recorded by the Pittsburgh Symphony. All forty-two pages flip over for viewing. My statement is there too. I have no idea if this video can be posted on this blog, but it is posted on the MySpace which is linked to this blog. I finished Pointe Mosaic, a piece done for Radenko Pavlovich's Columbia Classical Ballet company's autumn fund-raiser. I totally decontructed a pair of miniature sized, $5 sale pointe shoes. I cut the sections into mainly half-inch squares and added acrylic GAC 400 and paint. This actually made little "tiles". 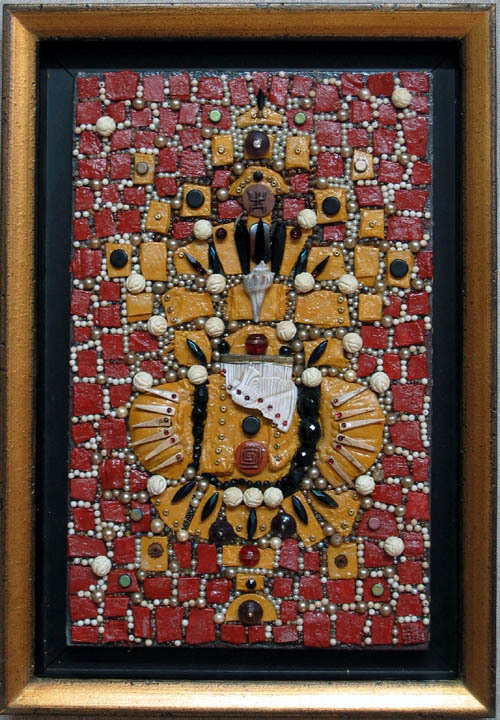 I then adhered them to a piece of painted wood and added all sorts of bead and found objects. The overall effect is almost primitively African. I actually looks really good and not at all like a pair of ballet pointe shoes. I was glad to be done with the charity piece because I could turn all my attention to the upcoming archeology project. In only a few moments all tension left me. 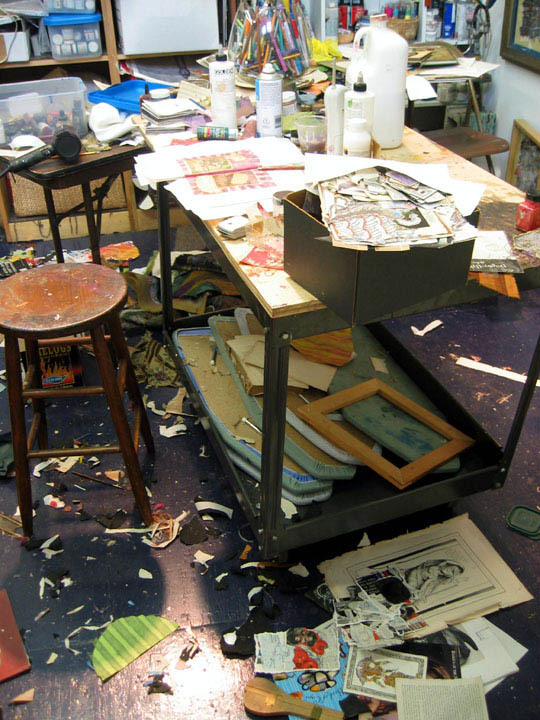 Nothing in my studio was sacred; everything was open to transformation. I can honestly say I've never had such a good time in my studio. My mind just followed each passing whim, from fabric to paper, from stitch to paint, from found object to recycled old piece, and beyond. I have three, nearly antique leather suitcases to fill with "artifacts", newly created, mysterious relics of a fantasy culture. Time just flew, but so did the results. This afternoon Mathias flew back home from Japan. He said that security was as heightened as the media had suggested but that the flights were fine. His guest dancing with Sapporo Ballet went well and he has until Thursday to pack for England. It is hard to believe that he is eighteen years old and moving to another country later this week. Tomorrow we are throwing a small, informal party to honor his recent gold medal from Varna. 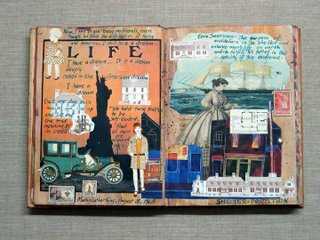 These are some of the pages, including the title page for my recent altered book American Dream. I've taken digital images of all the pages, approximately forty-two spreads. My son Alex is working on a video. We have to find background music. I wanted "Home on the Ranch" but only a bad melodramatic vocal recording is available on line. I'll try the library tomorrow for better, instrumental Americana music. Much of the technology escapes me, but I'm learning. In the meantime, I'm currently working on a mosaic. It is a charity piece for Columbia Classical Ballet. The event is supposed to be a silent auction for artistically done pointe shoes. I've totally cut my pair apart and created miniature "tiles" from the soles and hardened areas of satin and paper. With paint and various beads, I'm making a tribal inspirated mosaic on wood. Tomorrow will be another, wonderful day in the studio. 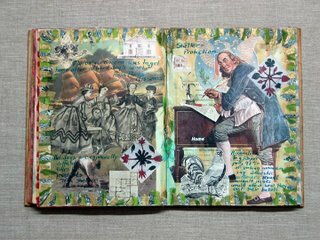 Since before we went to Bulgaria, I've been working on an altered book. I used an old Currier & Ives text and images gathered from several other volumes, including picture books on the Statue of Liberty and Norman Rockwell's Saturday Evening Post. I cut illustrations from Victorian magazines and various current subscriptions. I did hours of research online, getting statistics on the homeless, women's shelters, abuse, immigration, Ellis Island, and quotations using words like shelter and home. The pages I left in the book were first watercolored and then collaged with images. I used a peacock blue acrylic ink to incorporate the research. Although I started the project before I was asked into the Open Eyes 2006 invitational show, it came together and is intended for display in that upcoming exhibition. (Scheduled October 19-31 at Gallery 80808 in Columbia, SC) The book is now complete. I am thrilled with it, especially since it really addresses Open Eyes 2006 theme. Open Eyes is an artistic group supporting women's triumphs over staggering odds. After supporting Women in Black, the group focused on Makhtaran Bibi. This year the title is SHELTER. The inspiration is the work of the Women's Shelter and the courage of the women who cross its threshold. 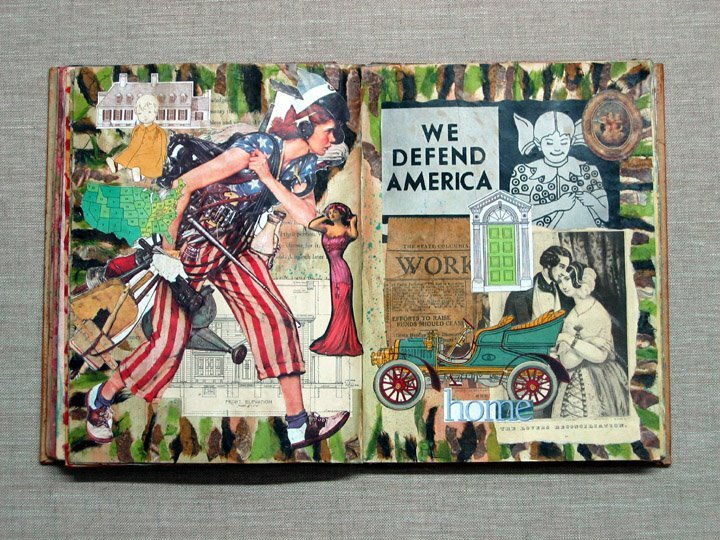 Thus, American Dream, my altered book, is perfect. Today I shot digital images of the pages and wrote the following statement. As the daughter of an immigrant, I was raised to believe in the American Dream. Hard work, courage and determination always paid off in dividends of prosperity, security, and a place of my own. For me, the American Dream is my wonderful home and family. At least that’s how it worked out for me. Yet, the older I get, the more I’ve come to know that this widely held belief doesn’t always work out so well for others. Too many women aren’t living the American Dream. Too many are abused, homeless, and struggling despite their best efforts. 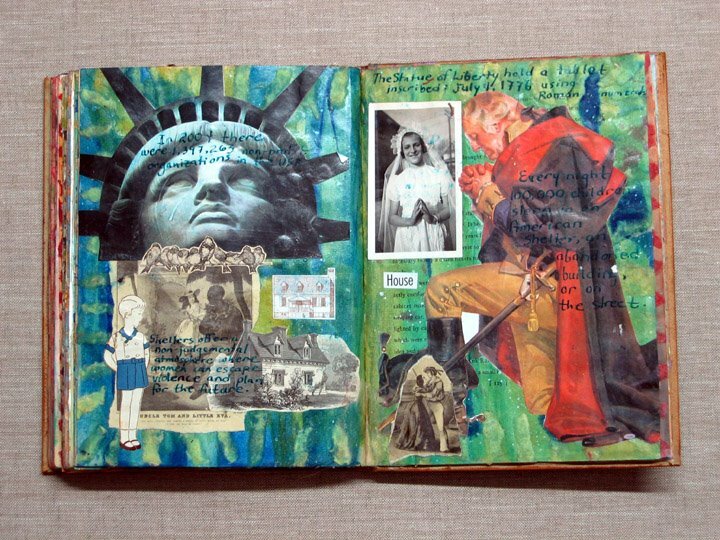 The pages of this altered book are meant to show the coexistence of the dream and the nightmare. Hopefully, readers will be inspired, like I am, to contribute to charitable causes and help those who are less fortunate. The one thing I’ve learned is that achieving prosperity is not quite enough. One must be willing to share it. Only then can the American Dream be fully realized. I'm trying to figure out just how this blog system works. I guess part of my desire to have a blog is to hold on to some of the wonderful, artistic things that have happened to me. One, most recently, was my first solo exhibit in a real museum setting. Blues Chapel was my installation in the Sumter Gallery of Art during the month of July 2006. 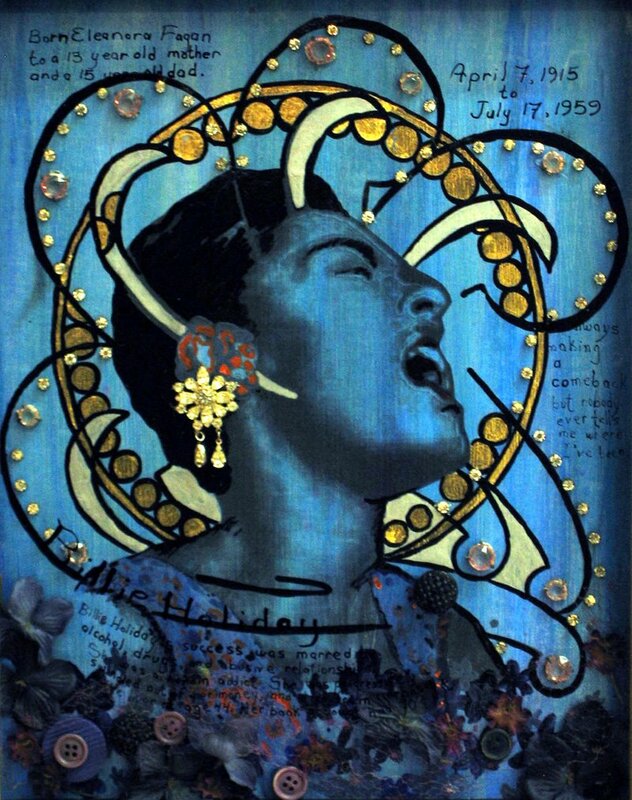 It was dedicated to the many early, female Blues singers who lived in a male dominated world, in a culturally segregated society, and worked in an unfair musical industry. 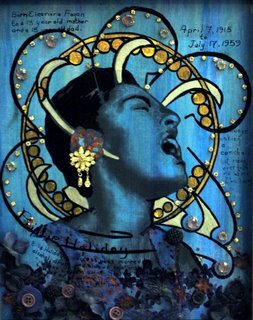 Singers from Ma Rainey, Bessie Smith, Billie Holiday, Ella Fitzgerald, Nina Simone, to Koko Taylor and Ruth Brown paved the way for the many singers of today. I had a wonderful time creating the 24 images. 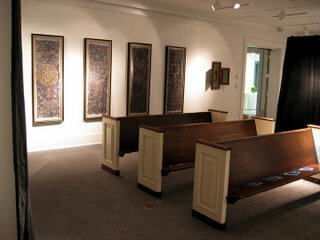 I had an even better time creating the atmosphere of a chapel, complete with mahogany church pews and fiber "stained glass" windows. I made faux-church bulletins and ole-time church fans. 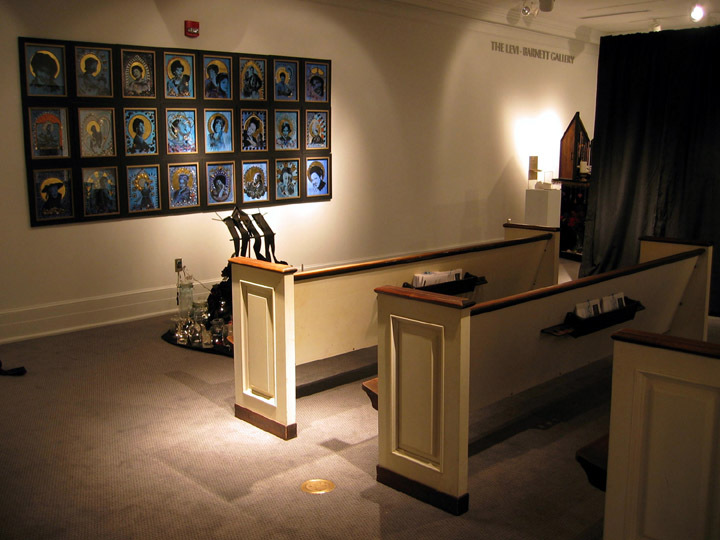 The installation was first shown during Artista Vista, an annual arts event in downtown Columbia, SC. Yet, the museum setting was quite wonderful. I only uninstalled it earlier this week. I'm hoping to have another location for it in the future. I'm already making another piece: A Blues Bible--an ALTARED book! Of course, I later had to call more knowledgable folks to get the correct information and post the upcoming art information. I went back to delete my error but decided to give blogging a try. I've been posting ever since with www.blogstream.com under the name www.artbysusanlenz or some such thing. I called the site, Art in Stitches, same as here (I think!). I figured that this was a good place to record my thoughts, plans, and artistic goals. It has worked wonderfully for this. Actually, I'd stumbled upon blogs before that time. I just didn't know what a blog really was or that I was reading one! There was a blog entry about my ballet dancing son, Mathias Dingman. A girl, the daughter of a pianist at UBA (now Kirov Academy of Ballet in DC) wrote beautifully about having met my son, though her heart still belonged to Rasta Thomas. She still posts. I will likely keep both blogs. The other one has recently had hundreds of "hits". Of course, this isn't due anything about me. It's been about my son Mathias, again! I've used that blog as my personal journal. I've always journaled, at least since I've been fourteen years old or so. I type over a hundred words per minute, so blogging was instantly easy. Anyway, recently, there have been two international ballet competitiions, one in Jackson, Mississippi and the other in Varna, Bulgaria. I wrote about each. Afterall, the blog was my day-to-day impressions. Very little "official" information flows out of Bulgaria. I posted my blog's address on a ballet forum. Hundreds have read it. Of course, I'm pleased, but this really isn't about me or my art or my own future. I've since found plenty of like-minded artists with blogs. They seem to be connected with "blog-rings". 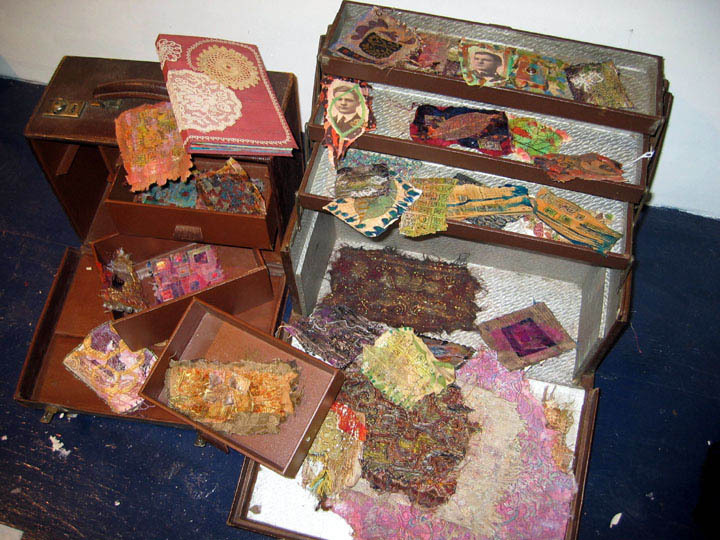 I've been quite inspired by the writing, images, and ideas expressed by other fiber artists. In order to network with these talented people, I think I need a new, professional blog. So, tonight, I'm starting. This is it. I have no idea how this site works, but the coming days will tell!